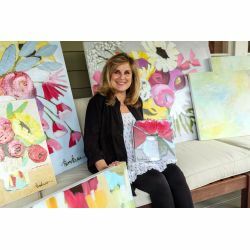 Kim Kreis comes from a 30 year background as cofounder and designer for Sweet Pea Designs fine personalized stationery. Prior to this, she received her Masters in Education and taught 4th grade in the most delightful farming community of Wicksburg, Alabama. ...with this background she has brought her love and appreciation of whimsy, color and teaching character to her newest stage of life...fine art! ​For Kim the process of painting has become the next step in appreciating God's great creativity through nature and color. The more Kim paints the more she believes that God reveals to her an important truth... that using whatever talents she is given, great or small, are for His Glory and never for her own. Currently, florals and flower ladies are Kim's passions. Flower Ladies represent women of diversity whether it is cultural, geographical, ethnic, political or religious background. They represent women who may or may not look like you but these women exemplify character traits such as strength and kindness and do not see their diversities as walls. Painting florals is also a major portion of Kim's daily painting. She is heavily influenced by her own gardens and says that you can not spend that much time gardening and not want to paint what you see.